Basically its a 12x12 cork board. Wrapped it in fabric. Pushed the pins through. And will mount it on the wall. Here is my finished one below. Each family member will get a square a year were thinking. But I actually still have 15 or so that I could put up. So it may just end up being some of the best ones put up or something. But every family member will have there own square. There own pins with there own fabric with it. We ment to go to Jo' Anns tonight to get the kids stuff. Ours were kinda a test trial to see if it would actually work, and so far it has. The weight of the pins is an issue... but I think I can figure it out. But these will go up on the wall for display! Will put up more photo's of the progress here. Im hoping tomorrow I will get the kids up and at least one of them done, and hopefully Tuesday it will be somewhat finished. But we are also looking at a cabinet to display them as well.... but these will go on the wall as a family thing. Hey Mase - that looks awesome! Great job and a great way to display. The cork board is a great idea. I started one as well but decided the particular one I picked was too lightweight, so I am going to move to a thicker piece. 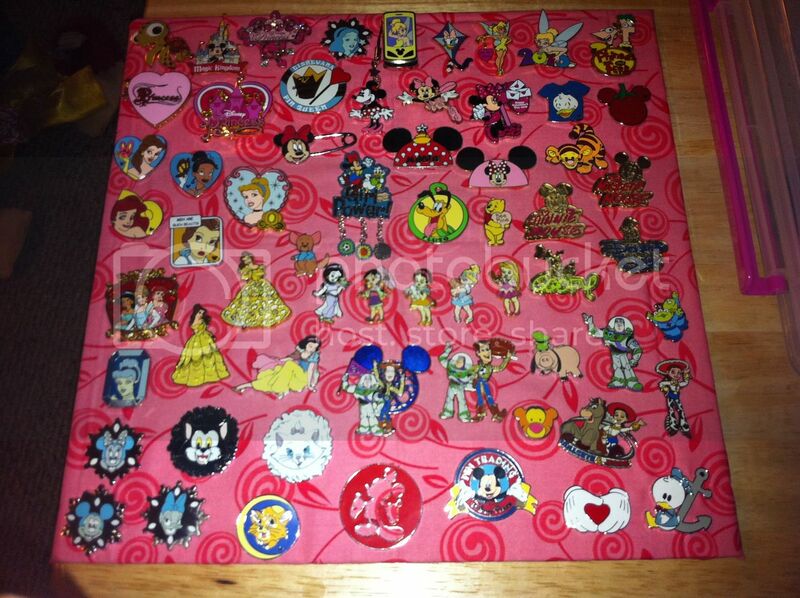 And I now have ALOT more pins. And I really like the idea of covering it in fabric - now I know what I will do with some of my leftover Disney fabric!! Much as I like my pin book, I would really prefer to have them displayed where I can see them without having ti lug out the book and page through them. See... that was the same issue with me. I wanted to display them. I want people to walk in the room and notice them. Dont get me wrong... a book set on a table is good... but not as effective. They wont feel comfortable just to grab it and start looking. If they are out... they will go up to them and look at them. So that was the issue we were having. I even looked at glass cabinets and came to the conclusion it was going to be too expensive. So I wanted to do what I did with my cards... but had no idea how. Tonight ill be going to Target and getting some stuff to hang them up. Again... I'm worried about the weight of them, and don't really want to use nails. So I'm hoping these sticky hanger things will work. Hopefully tonight ill have a picture up of the finished product! 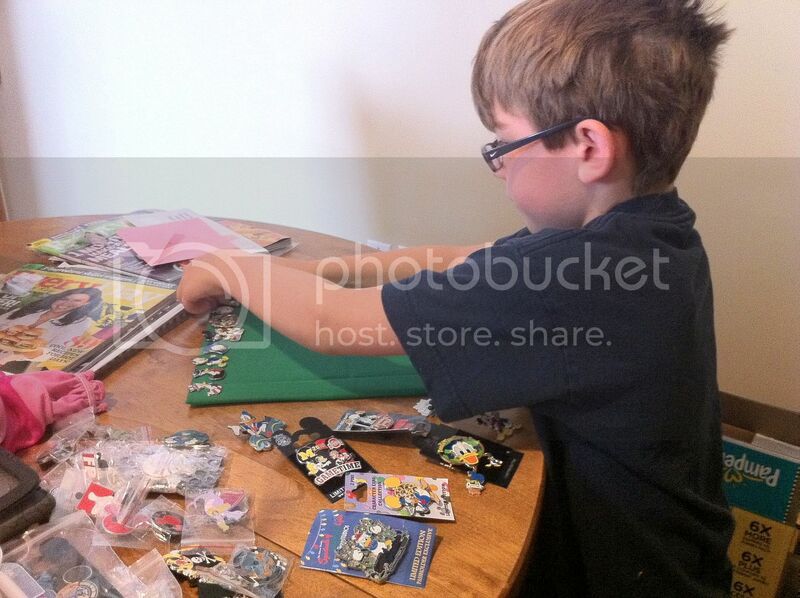 Great idea and a great family activity!! Nice job kiddos! What do you think about putting a frame around them? BUT IT WORKED!!! AND IT LOOKS GREAT!!!!! They look great! But....now you got me thinking. This could be dangerous lol. That. Is. AWESOME!!!! I love it! Um...one small issue. I think I see a loose thread on the green one. Why don't you send it to me - pins and all - and I will...um...fix it and return it to you just in time for your trip in Nov! Yes! 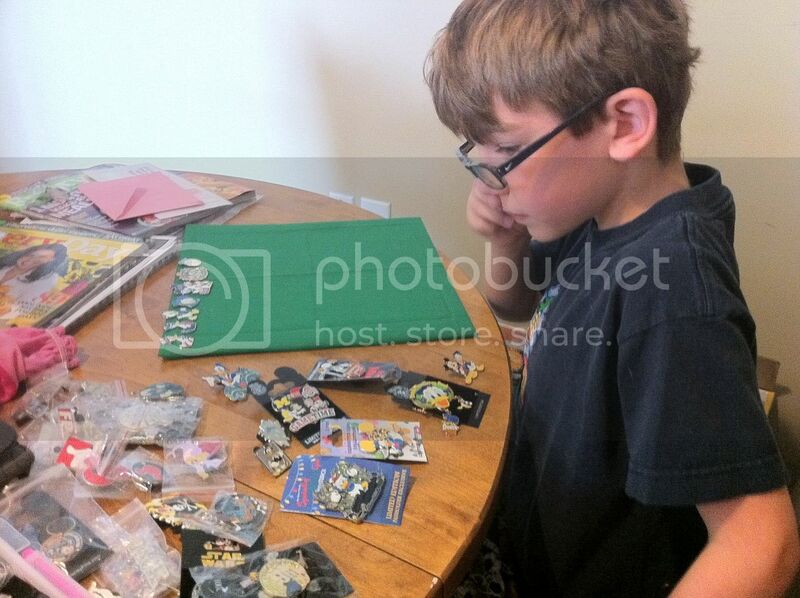 ER...do you think the boy would notice if any pins were....um...kinda missing when returned? Just asking. For no reason. And yeah... I think he will notice.... lol! Which one is it you liked... or if you "had" to have one... which would it be. Who knows? We may have 2? My eyes went right to the Pirate Mickey one in the third row - with the yellow flames and black flag. Very cool. When I get home... I shall check. 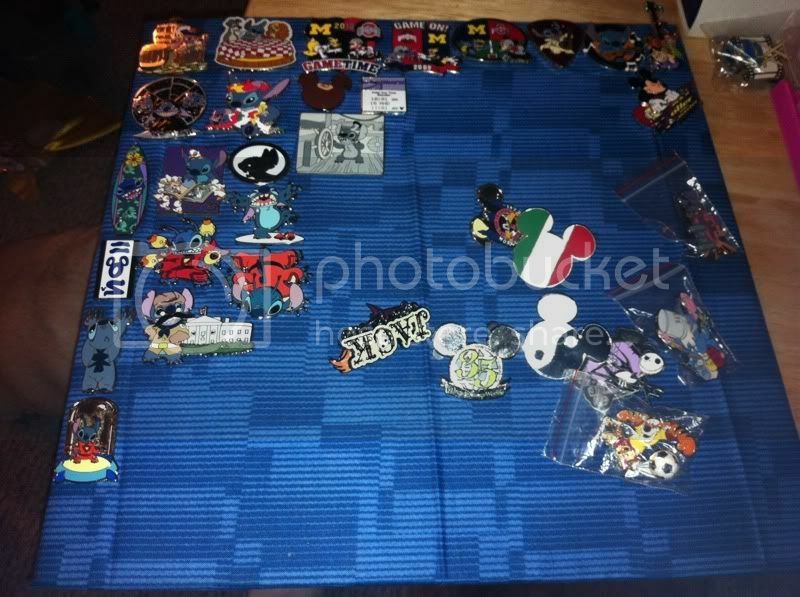 I believe that one came through one of our pin lots we bought for trading down there. So it may be possible we may have another one. 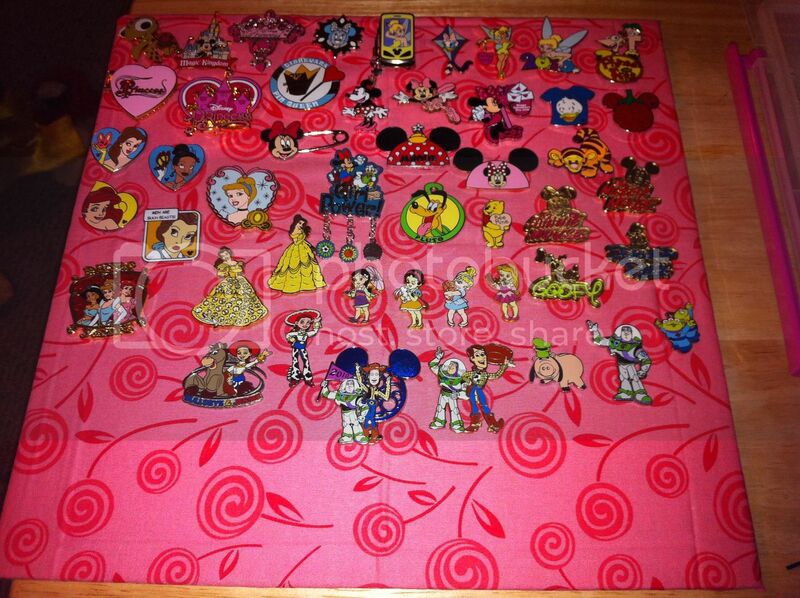 But I do know we have a lot of pirate pins as well. Mase, I love this idea. I have not been able to come up with a way to display the pins. This gave me an idea. I do not know how to explain exactly what I want Mark to build but it will be very similar to this. I am thinking since he is so bored siting at home that tomorrow we may make a Home Depot run so I can show him what I have in mind. Of course he will probably then tell me why it will not work lol. 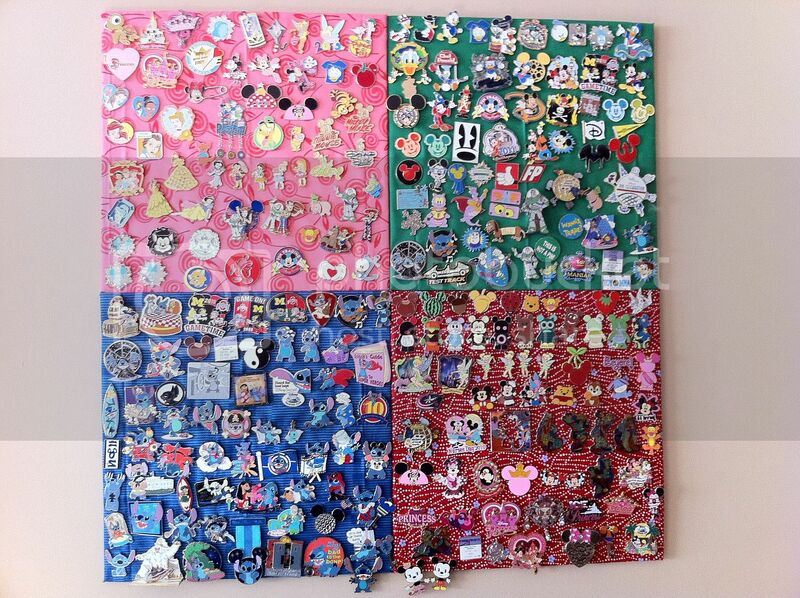 Very cool way to display your pins! I like the fabric idea..a regular old corkboard would be nice but this makes it a little fancier! 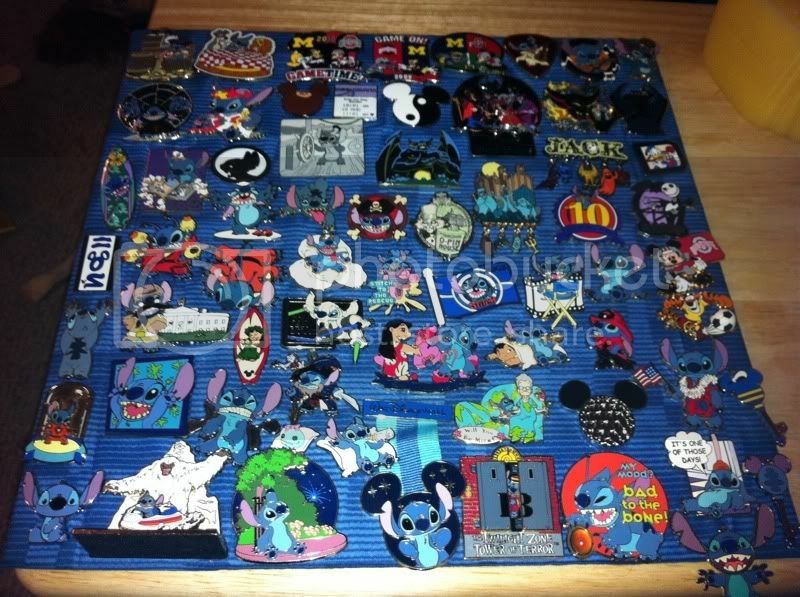 Are these all of your pins or just your favorites? For the most part they are all ours. I have one more block I can put up, but haven't decided if I'm going to put it up yet or not. Well, as I thought my first idea was a no go. Mark scaled it own a bit and is now working on it. Ours will now be very very similar to yours. I had a room divider type thing in mind. 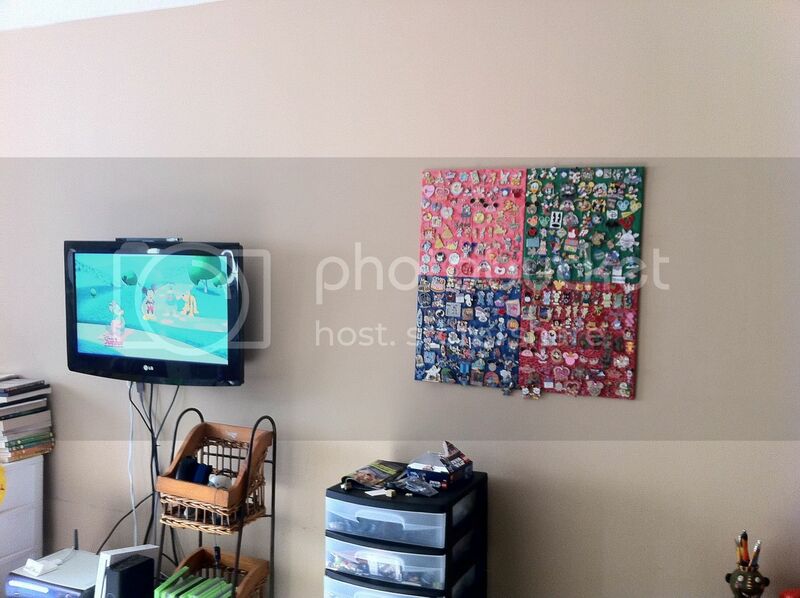 Did you attach your cork board to wood before you covered it? I actually use a smaller version of these for my cards. Hey Mase, what kind of cork did you use and where did you get it? All we could ever find is about 1/8 inch think and very flimsy. Has to be mounted on plywood or something. Thats what we got. 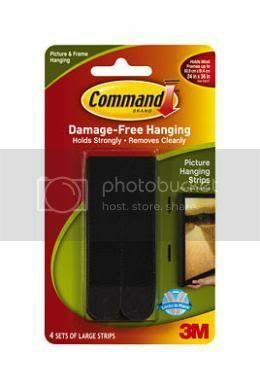 The pins go through it and the fabric, but with the Command Strips... the pins dont touch the wall. And say your still a bit leery about it. You could either put a little extra fabric on the back, or use two Cork Boards. For 7 bucks for 4 of them... its fairly cheap. I'm not sure if my husband has been lurking around here without telling me or what. 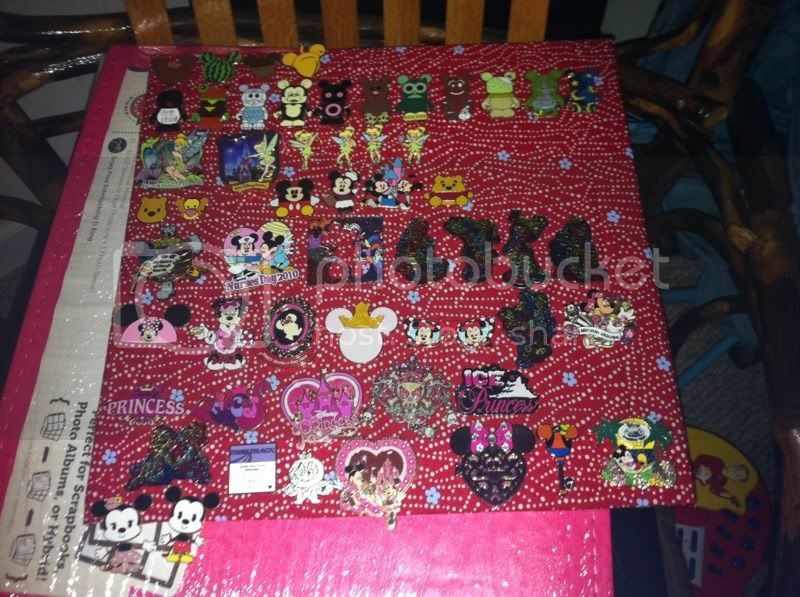 Today at Target he grabbed a little corkboard and declared that he wanted to buy it so that he could display his Disney Pins instead of having them piled on the cabinet like they have been for the last three years! His isn't nearly as fancy though, but all I can say is it's about time! Well, ours should be ready to hang after dinner. 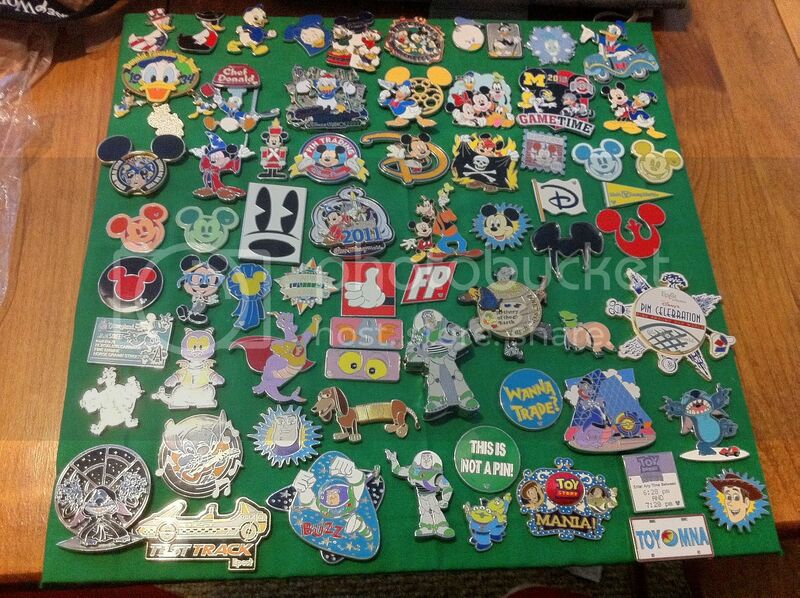 We are very much lacking in the number of pins we have though. Our biggest problem is probably going to be where to hang it. 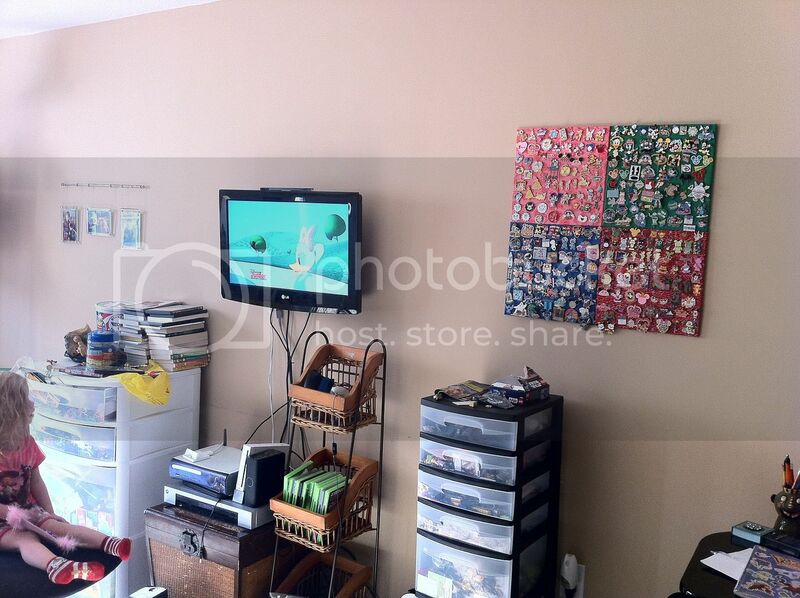 We have a ton of stuff that we have bought to hang in the basement and so far ONE picture has been hung. Maybe this will get our rears in gear and get that room finished. It has been painted for a year now. DVC Mom, you kow you now have to share a picture with us...please. 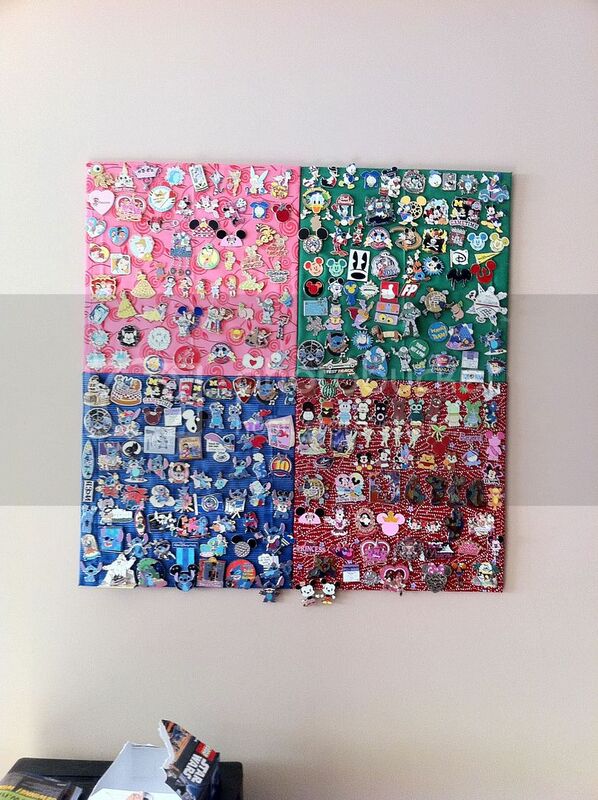 I also just realized that so far none of us have the very many of the same pins. Got a 2' x4' piece of 1/4" ply wood and cut in two t make 2 pieces 1' x 4'. Covered that with 4 - 1/8" cork squares that I glued on to the plywood with all purpose cement. Scrappy covered that with the black cloth. I built a frame and put a few partitions in it. Then painted it Mickey yellow. It can be mounted either way. Here's the finished product hanging. We hung it on the first landing wall going doen into my man cave. This has been bare since the remodel, so we figured good as place as any, and people can look at the pins while going up & down the stairs. I have another Idea in the making!